Walchand Institute of Technology, Solapur was established in July 1983 by Shri Aillak Pannalal Digambar Jain pathshala Trust named after Seth Walchand Hirachand.To maintain a high academic and technological standard is the main era of trust and Governing body of the Institute. With the inspiration of Seth Walchand Hirachand, the college delivers high proficiency in the academic and professional career of students. he Institute is affiliated with Solapur university providing the courses in various fields like production, computer, environmental, electronics, mechanical engineering etc. To produce young professional graduates/postgraduate/doctoral engineers for facing the challenges of globalization and modernization for the overall growth of the society. To impart quality education by conducting various academic programs. To provide an advanced learning process to students by creating awareness in the field of science and technology. To deliver industrial exposure to students by developing critical thinking, creativity, and discipline. To create consciousness among the students for engineering ethics, human values, social values, and outreach programs. Enhance the knowledge of students to achieve community and society development, social responsibility and accountability. Dimentrix, Syntel PVT LTD, Cummins, Lark India etc. Above fees are only for general category students. For reserved category, fees will be declared by the college after the verifications of documents. After applying online for an engineering course, the candidate needs to submit a printout of application form to the respective facilitation center. The candidate should submit their applications before the due date. Admissions through vacant seats or institute-level are done by the respective institutes after the CAP shall be done. The candidate should be Indian national. The candidate should have passed 10+2 examination of Maharashtra State Board of Secondary and Higher Secondary education or equivalent examination. The candidates must secure 50% marks in subjects like Physics, Chemistry, mathematics and other vocational-nonvocational subjects. 45% marks for backward-class students. The candidate needs to obtain All India rank in JEE-main or need to clear CET examination. An excellent corporate interface is provided by the training and placement cell. Outreach programs and student exchange programs are established for enhancing professional development. The institute provides workship/internships in various disciplines. The digital teaching-learning techniques are provided by the professional expert community. High quality and student-centered education carried out under Government bodies of the institutes. Department of Civil Engineering was established at Walchand Institute of Technology in the year 1983. Apart from this, the department also offered a postgraduate, Ph.D. courses. The department has developed infrastructure with well-equipped 13 laboratories. The department provides active high-quality technical support with different R&D projects. The department had organized National Ambient Air Quality Monitoring Projects sponsored by the board of Government of India. The department has received the national award from AICTE-CII. The Department of Computer Engineering was established at Walchand Institute of Technology in the year 1985. The department has modern computer labs with the installed latest software. The department consists of 5 computer laboratories with scanners, printers, multimedia mixers, legal copies of software like Windows NT, Linux, MS-Office, Visual Studio etc. Mostly 70% faculty of this department have completed their PG from reputed institutes. Lucrative campus placements are provided to students for sustaining their professional career. 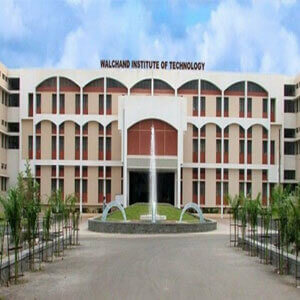 The Department of Information technology was established at Walchand Institute of Technology in the year 1999. The department is associated with computer engineering includes the study of computer applications, software, and computer machines. Faculty in this department won the awards for education in advanced learning and teaching process. The department has signed MOU’s with Infosys, IBM, Cognizant accredited by TCS. The faculty of the department organizes workshops, seminars, guest lectures, and industry visit throughout the academics. The Department of Electronics Engineering was established at Walchand Institute of Technology in the year 1983 which offers the 4-year undergraduate course in B.Tech (Electronics). The curriculum includes a study of digital electronics, power electronics, telecommunication, and skill development programmes. Practical and industrial aspects are taught by renowned personalities with outreach programs. The Department of Electronics and Telecommunication was established at Walchand Institute of Technology in the year 1999 with an intake capacity of 120 students. The programme is recognized by the Doctoral Research Center of Solapur University. The department includes the study of optical communication, digital communication, microprocessor, and microcontroller. Sponsored projects are offered to students in various areas of communication, electronics, software, and embedded systems. The campus placements like Tech Mahindra, Actys Systems, TCS, Cognizant, KPIT Cummins provided to students with higher salary package. The Department of Electronics and Telecommunication was established at Walchand Institute of Technology in the year 1983 with the intake capacity of 120 students. The department offers the 4-year undergraduate course for engineering students. The department has received NBA and CII accreditation for maintaining a high standard of education. The research programs are organized by organizing national and international level conferences. The department strives to establish a high-class education standard for the community and social development. To organize campus placement for UG and PG students. To sponsor internship and training programs in various industries. To facilitate training sessions for cracking the campus interviews. Walchand Institute of Technology was established in 1983 by SAPDJ Pathshala Trust. We, at WIT, dedicate ourselves to prepare competent engineers for providing professional and ethical values in the competitive global environment. We are committed to impart quality technical education for fulfilling future needs of industry. WIT offers the 6 undergraduate programs and 4 postgraduate programs with 2160 students and 120+ faculty. We have an excellent placement record with top-notch recruiting companies. We have R&D Entrepreneur development cell to explore research culture and enterprising skills among the students and faculty. So, join WIT to showcase your extraordinary knowledge and skills with respect to industry interface.